Background: Maple and Bean are unable to go with their human family on their move to Germany… so their people must reluctantly find a new home for both dogs. Together since birth, Maple and Bean get along great with each other and we want them to be adopted together. 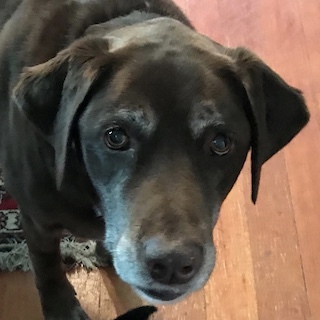 What Maple’s and Bean’s owners say: Bean and Maple were seven years old when they came to live with us, after a woman was widowed and couldn't handle them and her two other indoor dogs. 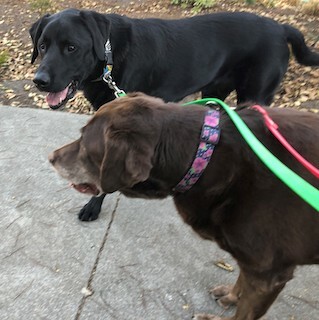 They were not potty-trained or leash-trained and jumped for food, but within a couple weeks and with training over the year, they were on track and now are good on the leash, with potty, with waiting (eagerly!) for food and sitting at door to go out for walk. They have both had dental surgery this year to get them caught up on their health exams, taking out a broken tooth and an abscessed tooth apiece. Other than that, these are two very healthy 8-year-old dogs at their correct weight (a "5/10" good for bigger dogs), and with energy that lets you take them with you hiking, swimming, camping, and on trips. Maple is a very passionate and compassionate dog and for that reason we call her "therapy dog." She will come snuggle you just so if you have a headache, she will lick the face of your child when they are cry out or just because they are giggling, and join into a family hug or play wrestling to lick everyone and make sure everyone is happy. She inserts herself into the action - whether it’s a crashing wave or people talking, and can also be unflappable, like when her brother is excited getting into the car, Maple lies down cool as cucumber. The dogs are not allowed on our furniture but need regular reminders, and Maple gets away with some things because of her pushiness with a strong topping of sweet - like when Maple climbs into bed in the morning and finds her way under your arm, licking you, so that it can be hard to move her and then it seems cozier to just enjoy her talent for snuggling. She is also squirrel and cat crazy when she sees them outside our window, and has that desire to chase, but when faced with either in the flesh, doesn't know what to do about her excitement. Maple loves to run in open spaces and explore. Maple can occasionally bolt if the door is left open but probably wouldn't if she had a yard for some more movement. When she leaves, she comes back joyfully in about 20 seconds after sniffing for a squirrel and enjoying the moment of freedom. We think it’s because she was stuck in a back yard for so long that she reacts to this open door as a reason to run. Bean, by contrast, is a pretty chill and subservient dog and will find a quiet spot if there's a lot of people around, where he can see kids leaping from the furniture to make sure he isn't surprised from behind. He follows his sisters lead and when she bolts gets excited but immediately stops when you call him to wait for approval, and even tries to get his sister to come back. He is great on hikes and jogs on the leash, staying right by your side, sensitive to your every turn, speed up or slow down. When he is out in the open off leash, he seems like a herding dog, checking on everyone in succession, whining a bit if he can't see his sister who is happy to go off on her own exploring and sniffing. Both dogs love to swim and get along great. Maple is the leader between the two and is " a pushy broad" as we like to joke. Bean, when he hears a siren, nudges his sister so that if he wants to howl, he can still follow her lead:) They bark as someone climbs the steps but if you tell them it's you from outside, or if you're home and show Bean the bark collar, he takes the hint. 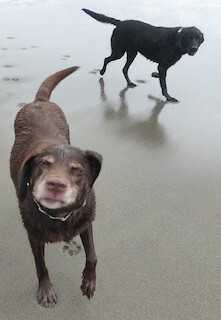 Two very sweet dogs who would like an owner that doesn't expect them to be 100% tamed but a good 95% with their quirks. 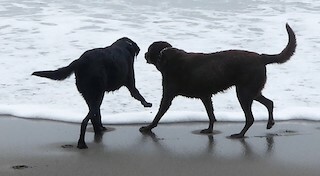 Two lovable labs with very sweet and complimenting personalities. What Maple’s and Bean’s Rescue Rep says: We consider Maple and Bean as a bonded pair… and they will be adopted together. Great dogs for a family with kids. The recipe for adoption success with these two should include: camping, hiking, trips to beach, pool action, belly rubs, lots of walks and exercise… and little bit of obedience. Both dogs were crate-trained in their past but are likely out of practice. Maple will chase cats and Bean will chase Maple… so Bean will end up chasing the cat too – might be exciting! Medical Information: Current on vaccinations, chipped, spayed/neutered, and negative for heartworm. Both dogs are in very good health.